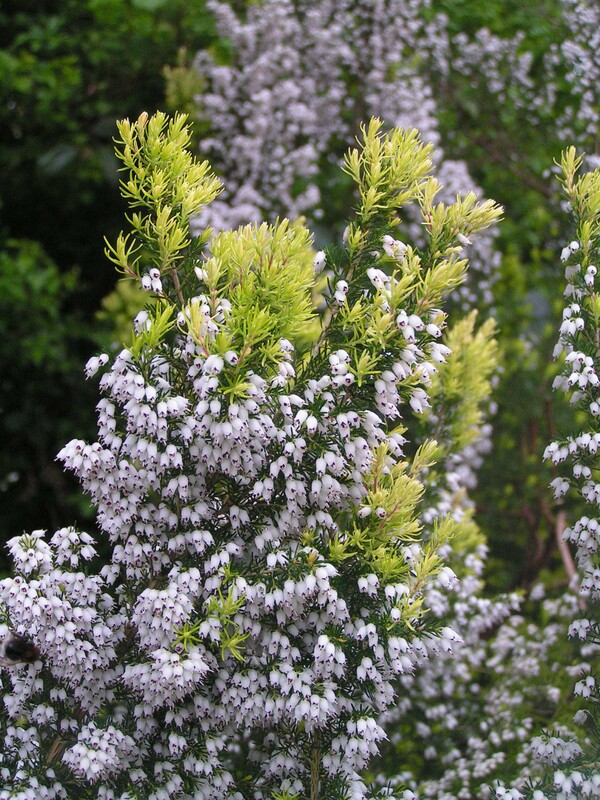 Erica x veitchii : Veitch's heath are a hybrid between tree heath (Erica arborea) and Portuguese heath (Erica lusitanica), represented in cultivation by at least five cultivars which vary in hardiness from zone 7 to zone 8. Veitch's heath can be grown in most alkaline soils. Shoots hirsute with both simple and plumose hairs intermixed; leaves linear, to 6mm long; flowers white, in terminal whorls of 3 or 4; calyx 4-lobed, green, cup-shaped, waxy, thicker in texture than corolla; corolla tubular-campanulate, to 4mm long; stamens 8, included or tips just visible at base of corolla lobes; filament with spicules on lower quarter; anthers with spurs.